Modern day warrior, mean mean pride! Have a great weekend, Jeremy. Ha, I love this question. 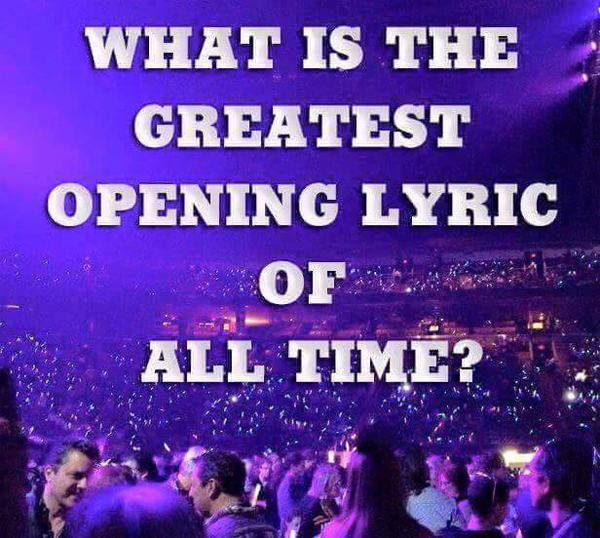 Mine would be..."Dearly Beloved we are gathered here to get through thing called life." My greatest opening lyric would be "HELLO DARLIN'" BY Daniel O Donnell of course. Areosmith's 'Amazing', "I kept the right ones out and let the wrong ones in. Had an angel of mercy to see me through all my sins"
Harold and Maude, god I love that film. That's a playful, happy one. Good pick, Jeremy. I'm going with "I believe the children are our future. Teach them well and let them lead the way..."
Be well, friend, and thank you for stopping by with encouraging wishes. The beginning of Def Leppard's Rock of Ages - whatever the hell those 4 words are!